In the story of the reception of Greek tragedy throughout the English-speaking world, Murray is a figure of immense importance. He unlocked the gates of commercial theatre to its performance - and its performance in verse - on both sides of the Atlantic, bringing to the project his enormous personal prestige, especially after his election to the Regius Chair of Greek at Oxford (1908).His Oxford Classical Text of all the complete plays of Euripides lent scholarly weight to his theatrical enterprise; for, passionate though he was about communicating Greek culture to the widest possible public (by the 1920s over a quarter of a million copies of the translations had been sold), he could never be written off as a mere popularizer. Most significant of all, he laid down in the early years of the twentieth century the terms on which scholar and public alike have viewed Greek drama throughout its course and into the twenty-first. It was Murray who insisted, from the pulpit of the popular stage, on the political nature of Greek tragedy (first connecting Troades with the fate of Melos); on its historical resonances (Troades chiming with his own distaste for British conduct of the Boer War); on its social urgency (his support for women's suffrage informing his Medea); on the religious and anthropological assumptions that permeate it (his introduction to Bacchae acknowledging his debt to Jane Harrison); and on the remarkable psychological truth in its delineation of character (emphasized in his notes on Electra). And on all this he insisted as a man with a keen instinct for the theatre, who was deferred to alike by actors (Sibyl Thorndike), by directors (Granville Barker) and by fellow playwrights (George Bernard Shaw). His was the voice which had something wonderful to communicate and which could not be ignored. Gilbert Murray was a British classical scholar; born 1866 in Sidney, Australia; died 1957. In 1908 Murray was appointed regius professor of Greek at Oxford. He is best known as a Greek scholar and especially as a translator of Greek drama. His translations were rendered in heroic rhymes to preserve the rhythm of the originals. James Morwood is Dean of Wadham College, Oxford, translator of eleven of Euripides' plays in the World Classics Series, author of numerous Greek and Latin language books and of The Life and Works of Richard Brinsley Sheridan (1985). James Morwood is Dean of Wadham College, Oxford, translator of eleven of Euripides' plays in the World Classics Series, author of numerous Greek and Latin language books and of The Life and Works of Richard Brinsley Sheridan (1985). Gilbert Murray was a British classical scholar; born 1866 in Sidney, Australia; died 1957. In 1908 Murray was appointed regius professor of Greek at Oxford. He is best known as a Greek scholar and especially as a translator of Greek drama. His translations were rendered in heroic rhymes to preserve the rhythm of the originals. †James Morwood was Emeritus Fellow of Wadham College, Oxford. 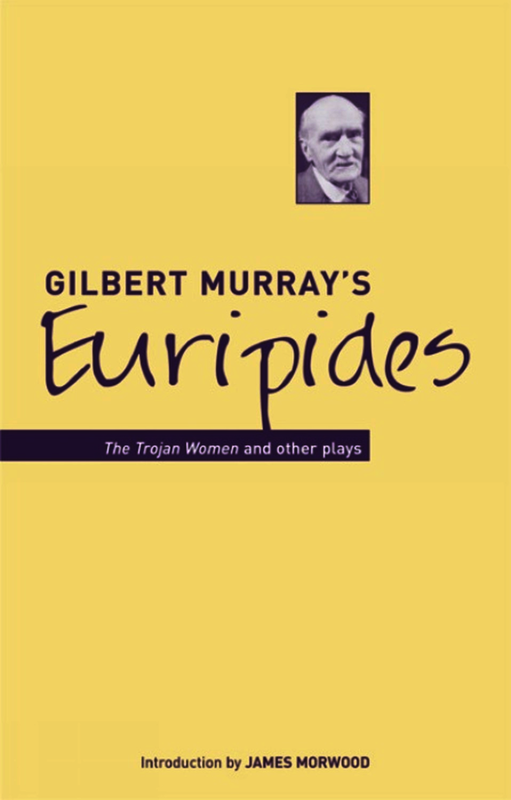 Among his numerous publications are translations of eleven plays by Euripides in the Oxford World’s Classics series and 'The Plays of Euripides' (Bristol Classical Press, 2002).